Boulton`s Siding`s Lilliputian by Colin Binnie. Let me start this introduction to Lilliputian by admitting that the drawing is based on scanty information. My only excuse for producing a drawing at all is that I have often day dreamed about the sort Of engine that would have been produced for the two foot railways had the decision to employ steam been made in the eighteen forties instead of the eighteen sixties. Just imagine a two foot gauge Bury; all polished wooden lagging and gleaming brass. Ah well, it didn't happen. But of course there were two foot gauge engines before Spooner brought steam to Festiniog. 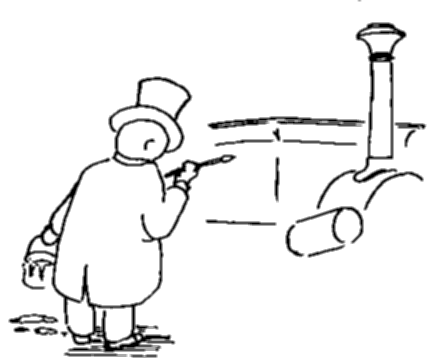 Alfred Roslin Bennett illustrates two of them in The Chronicles of Boulton`s Siding , the earlier one in the form of a side elevation drawing (fig. 22) and the other (fig. 23) in the form of a simplified elevation and plan with most of the detail missing. The first of these engines was called Little Grimsby and was converted from standard gauge in 1861. The second was built for the two foot gauge from the start but the precise date is a mystery. Bennett says she was built some time later than Little Grimsby but fails to say whether this was some time later than the original construction of Little Grimsby or than the date of conversion. It is with this second locomotive we are concerned at the moment but before we get on with our story let us take a look at the manufacturer. Watt made the steam engine stated with a questioning inflection is one of the classic silly sayings. There was of course more to the matter than that and the partnership of Boulton and Watt was justly famous. The father of our hero was a relative of Mathew Boulton and was so proud of the connection that he christened his son Isaac Watt Boulton. With such a name it was perhaps a foregone conclusion that Isaac would be a steam engineer. After training under Richard Peacock, later of Beyer, Peacock he worked on various railways before setting up a unique business in second hand engines. Contractors and impecunious railway enterprises knew him well; he would purchase obsolete engines from almost anywhere and rebuild them into something more useful to his clientele. In later years Boulton built locomotives from scratch, these were in most cases as original as his rebuilds. The engines were often odd, always interesting and in many cases downright peculiar. It is fortunate that Roslin Bennett knew the siding and its proprietor well and wrote such a wonderful account of their work. If you, gentle reader, have not got a copy of his book, then beg, borrow or purchase one. Nearly all the information given in this article is abstracted from this work. I can truthfully say that the facts are mainly Bennett, the errors all my own. My own drawings are an attempt to clothe the bare bones of Bennett's scholarship and should not be taken too literally. Nevertheless the locomotive as drawn is not likely to be too far from the truth since it is remarkable how the details slot into place on Bennett's framework. One further story concerns the chief book keeper, one William Knowles, who was an enthusiastic painter. Not as one might suppose of water colours, nudes or similar endeavours but as a painter of locomotives. Bennett records that he was often seen, even after working hours, painting and lining Boulton's locomotives, often scorning protective clothing and working in top hat and frock coat. Since Boulton had no set livery for his locomoties the colours were many and varied and the lining often complex in the extreme. I have a photograph of Ant presumably after Mr. Knowles attention, in which the panel on the saddle tank is formed of a series of curly motifs rather reminiscent of those surrounding the title on the title page of a Victorian book. Should you be tempted to model Lilliputian, let yourself go, think of our top hatted friend putting his heart into it and finish your model in all the curlicues and quirks of the Victorian sign painter. Now for the history of Lilliputian. As one might expect from a quaint locomotive built by an unusual company and painted by an eccentric book keeper her history was different to most other locomotives. She was built for a two foot gauge colliery line but after a short period doing her humble duty was recalled to the works. Here the saddle tank and wheels were removed and the resultant unit fitted into a steam launch. The engines were connected by bevel gearing to the propeller shaft and a clutch box similar to that used on bolt screwing machines, being provided for reversing . Why the latter was necessary I do not understand, unless the original valve gear had been modified. The steam launch, required in such a hurry, was destined for no less a personage than Albert Edward, Prince of Wales later to become King Edward Vll. Edward who was then a student at Cambridge used the launch on the River Cam. Lilliputian never returned from her nautical adventures though Boulton apparently built several other similar engines to the same drawings. The engine herself is interesting: Being a member of the noble family of geared engines and geared two to one for good measure, her appearance when in motion must have been delightful. Just think. When she moved forward her connecting rod and engine motion would apparently be in reverse and rotating twice as fast as the wheels. For a moment, just picture in your mind's eye the effect of the coupling rod swinging round gently with the connecting rod behind it urging its own crank round in hasty opposition. One last point before I close. 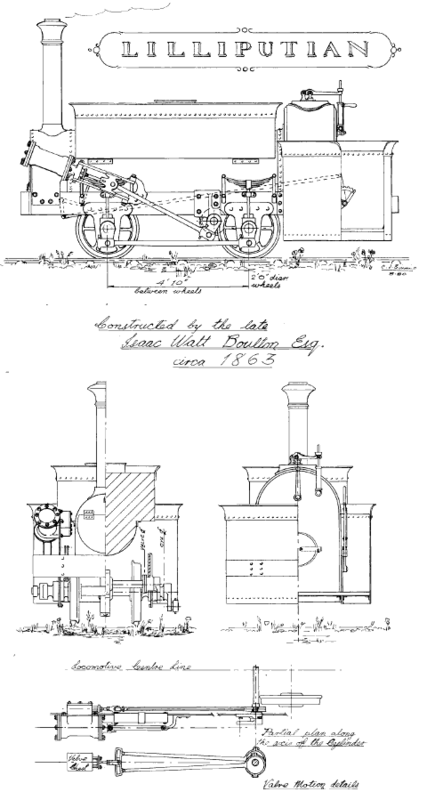 As we have seen Boulton built a two foot gauge locomotive in 1861 and was, in fact, asked by Spooner to quote for the supply of locomotives for the Festiniog before steam traction was introduced to that line. Does anyone know of an earlier two foot locomotive than Boulton`s? Was Boulton the first? Is Isaac Watt Boulton the man we should honour for first putting steam on the two foot and thus providing us with our hobby? For the answer to these questions see our future correspondence columns. Read MODEL RAILWAYS` FOR 'Pundits in Battle`. More seriously, does anyone have any more information? Can anyone Offer any constructive criticism of the drawing? I will be happy to modify my drawing if further facts can be found.